I bought this for my son who grills almost every day in the summer. The reason I chose it was partially a gag. He loves army knives and gadgets and carries them on a key chain for work. I had no idea this was a known item and he was very excited to get it. Laugh’s on me. Take charge of summertime cookouts with this five-in-one multitool featuring stainless steel utensils. 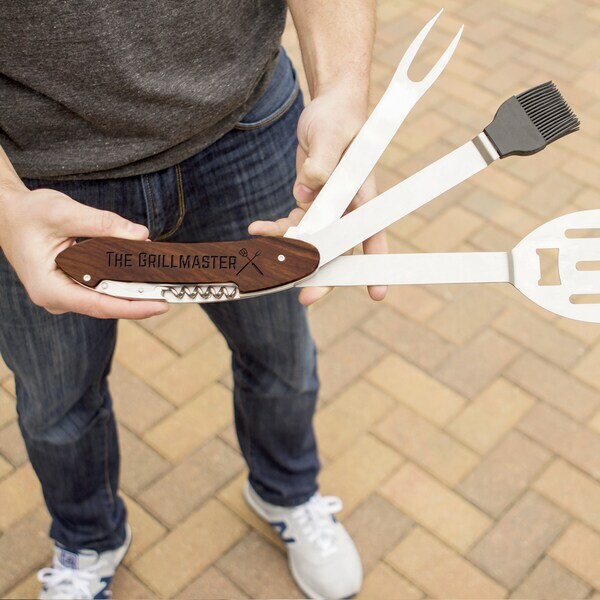 The detachable spatula lets you flip ribs, chicken and steak with ease, while the included nylon pouch allows for convenient carrying wherever you grill. Dimensions o Tools not Extended: 11.7” L. x 3.46” W. x .82” H. o Spatula Separated: 17” L. x 3.46” W. x .82” H.